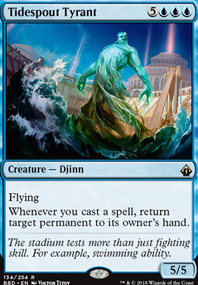 I might throw Reality Shift into your sideboard or possibly mainboard. 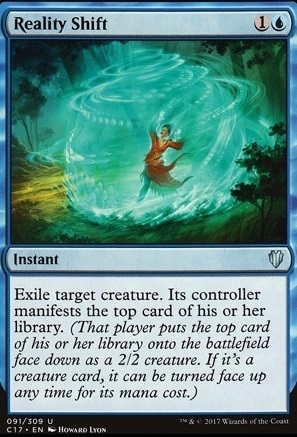 I like to run 2-3 targeted exile removal to take out pesky hatebears that sometimes avoid counters. 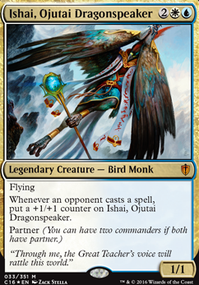 Plus the possibility to 2 for 1 with an opponent's top deck noncreature card is an added bonus. Hey all! I am back and I am continuing learning how to build my deck. I will keep it short as I am getting ready for bed. I'm the guy who built this as my first non-precon deck ever. I have gotten extremely strong and helpful feedback from here so I wanted to come back and get some more advice on what creatures or other spells to cut. I am going for zombie graveyard play and mill to play with graveyards for now. Please help educate me on how to know what to swap, cut, etc when replacing spells in an existing deck. I don't know what cuts to make for creatures, what counters to run, or what my wincons are even... because right now I do not even have any that I am aware of. 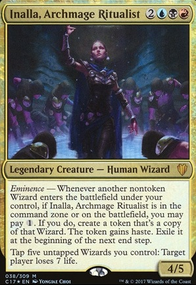 I was going to cut Mystic Remora as when I've played it I have not been to pay the upkeep and play what I needed to out of my hand. This is [u]not[/u] a final cut but I just have not had luck with it. [b]I also was NOT scrying and doing the life loss with Scarab God, I missed all my triggers and felt so dumb after[/b]. But I am not being hard on myself, it is just something I have to get used to and get into the habit of, it is part of Commander anyway! So what I was going to try was Graveborn Muse and Forgotten Creation . I am going to cut some counterspells too, this list is as of a day or so ago but today I placed the orders for the new cards. I just don't know what to cut and what to run at this point, it seems like I have a TON of firepower now compared to when I first pieced it together just two weeks ago and now the deck has taken on a life of its own. I tried to work on some token generation too. Also, I have at LEAST $60+ I want to blow at Star City this weekend, any recommendations on heavy hitters I can pick up while I'm saving on cards anyway?? I am thinking maybe Grave Pact and Rise of the Dark Realms . Pickups at Star City possibly include Rot Hulk and Reality Shift . I am new and am abandoning hope because I don't know what to do and I don't want to waste time or money on stuff when I am not getting the answers I need and no one really wants to take the time to help me. Then I get frustrated because I put so much time into this build and I don't know things due to lack of experience. @Kiyomei To answer your first question, City of Solitude obviously shuts down a large part of what makes Rashmi tick. 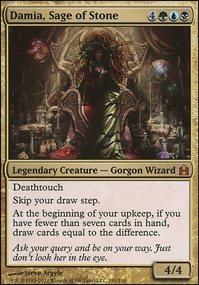 Graveyard hate can prevent recursion and potentially exile win cons. Setting Sanctum Prelate to 2 would hurt us the most. 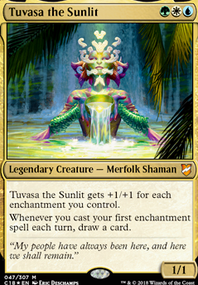 A majority of our answers and win cons have a cmc of 2 including Isochron Scepter , Dramatic Reversal , and Reality Shift . We can still recover if we draw 1cmc answers . Why Ancient Animus arent Chaos Warp , Pongify , Rapid Hybridization , and Reality Shift all better by far?